When used in dentistry, teeth inlays are used as indirect restorations. They are made from material like porcelain, gold, and least commonly cured composite resin. Inlays are then fixed to the cavities in the teeth and fixed into place in a cement like manner. The method that is used to fix inlays to the teeth requires your dentist to fabricate the restoration of the mouth, by creating dental impressions of the tooth, as opposed to putting a soft filling onto the tooth. Quite often in dentistry your dental practitioner will plan to restore your damaged tooth by using an intracornal restoration. In surgery it then becomes apparent that the tooth is clearly a lot more damaged than initially thought. This then means that using a composite filler, or the like would make the tooth weaker, and prevent you from being able to bite correctly. When this happens you will be told that you need inlays instead. You will be able to choose from a variety of materials, and it will be down to your personal preference as to which material you select for the inlay. What Is The Difference Between Fillings and Inlays? When a dentist places an inlay on your tooth, the restoration will be completed using minimal contact, in order to minimise the decay that is present on the teeth. When direct fillers like composites are used, the paste that is used to harden the filler shrinks when hardening. When it shrinks, there can be stressful to the teeth and gaps that are preset, making the filler fail. Your dentist will have the first hand knowledge and experience to be able to know when normal fillers will not work, and he or she will prescribe inlays to ensure that you can gain back your confidence and be able to restore your smile. Inlays have a long lifetime, and when put on you teeth by one of our professional dentists here at VitaSmile, you will be well on your way to the smile that you deserve. 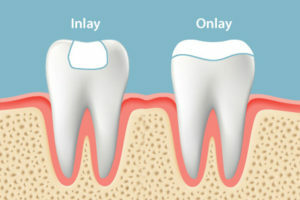 An impression of your teeth will be made, and an inlay will be custom made before it is fixed to your tooth (or teeth). Inlays offer a more customised filler and they are a lot more intact than your typical filling. They’re great for teeth that are weakened. Many are scared at the prospect of having to have a dental procedure performed. By putting the restoration off, you are in fact lining yourself up to need more work done later on down the line. Tooth decay is not something that should be ignored. Even by maintaining correct oral hygiene by flossing, brushing and using mouth wash after meals, you will never be able to turn back the clock. Whatever tooth damage is there, will not be able to be reversed. You will however, be able to repair the damage and prevent further damage from occurring. Our team of professionals are here to help you get back the smile that you deserve We understand how it can be daunting to have to have such procedures performed and we are here to help.